There are certain things that happen annually in life of a student. The lively orientations held by colleges and universities, awkward and funny ‘getting-to-know-you’ activities on the first day of class, midterms, and final exams. Although, just because something is part of your everyday routine, doesn’t mean that it isn’t special. To find out exactly what that means, take a look at the Enactus SLC team and what they accomplish annually in the name of charity and community. Each year Enactus SLC launches initiatives aimed at improving the community, from teaching children financial literacy, to constructing a greener community. Every new semester brings fresh faces and new ideas about how to do more “good” in our own little part of the world. But it doesn’t end here. There is one particular ritual that most students never really get to see, except for a lucky few. Every year, a body of like-minded people gather to share accomplishments and create memories that will last a lifetime. This is the Enactus Canada Regional Competition, to be held in Mississauga this year. It isn’t all fun and games of course, hard work must be done in the community before teams have anything to present. The presentations consist of endless hours of script writing, arranging PowerPoints, techies tending to machines that everyone can only hope will perform on the big presentation day, and of course many nights spent practicing until the script becomes a part of everyone’s heart. All of this time and effort to show our peers the impact we have on our community. There is one other thing that those lucky enough to attend must do before they step on the bus and begin their journey; create a spirit video. A statement of their intent to show just how much energy and pride has been put into what they have done over the past year. It is on this note that we would like to present to you the 2019 Enactus SLC Spirit Video, and ask you, do you think you have what it takes to be in our 2020 feature? Will you take the journey with us lucky few? On May fourteenth through sixteenth, 2018 our Enactus SLC team travelled to Toronto where we competed at the Enactus Canada Nationals Exposition, where students were brought together to celebrate the achievements from the past year. We highlighted our community outreach projects focusing on financial literacy and collaborated as a team to deliver a seventeen minute presentation on the compliments of the past year. Over the course of the three days, we had the chance to network with academic and industry leaders from across the country. During the experience we bonded as a team and built leadership skills. We learned about various projects that were tackling food insecurity, financial literacy, challenges with the environment and a host of other humanitarian causes. We enjoyed multiple presentations put on by our counterparts and our team was able to take on new ideas for next year. This was a great learning experience for all of the Enactus SLC team and we are eager to start on new projects while improving previous ones. We are part of a community that is continuously working towards improving the world, and this event was one small step on that path. 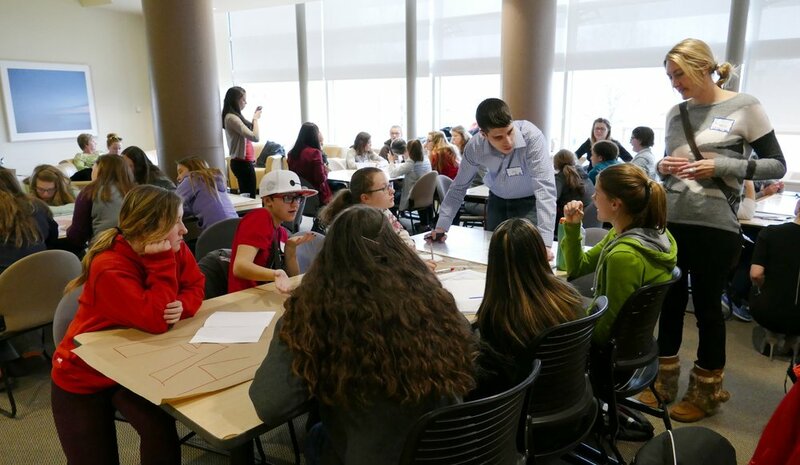 Dating back to 2013, our yearly Young Women's Innovator's Conference has inspired young women in grade 7 and 8 to begin considering their post-secondary options and future careers. Each year the team has arranged guest speakers in areas of entrepreneurship, creativity, innovation, and leadership; changing the main focus each year. This one-day enrichment opportunity is supported by the Ministry of Education and the Ministry of Training, College & University’s School College Work Initiative, and the SCWI. It was developed by PASS (Partnering to Achieve Student Success), the regional planning team made up of Eastern Ontario’s three colleges and nine local school boards. The event brings together over 100 girls from the Kingston and surrounding areas for the one-day workshop! Click on the photo above to read Mary Gooderman's article in the Globe and Mail that highlights our Manage Your Money project! Click the photo above for the Maclean's article on St. Lawrence College highlighting the work of the Enactus team! Over the years we have been participating in multiple food drive events. One particularly is the Halloween Harvest event where the Enactus team along with Community Integration through Co-operative Education (CICE) students along with other community groups go trick-or-treating for donations to the Partners in Mission Food Bank. Flyers are distributed to neighbourhoods prior to the night to inform homeowners of the food drive. Once the drive is completed all the items are sorted at the Bayridge Alliance Church on Gardiners Road then sent directly to the Food Bank. In 2015, the community collected 5651lbs of non-perishables and $2274 for the Partners in Mission Food Bank! Click the photo for an article on the Halloween Harvest event written by Charly Foote at Snapd Kingston!